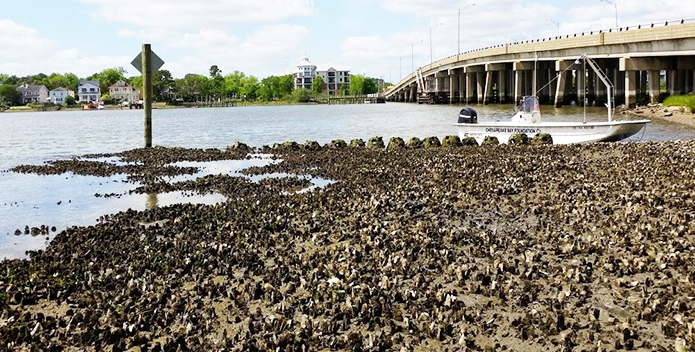 Low tide reveals oysters and reef balls on Virginia's Lafayette River Granby Street reef. CBF's oyster restoration programs offer citizens the tools and information needed to help restore native Eastern oysters to the Chesapeake. CBF's oyster restoration programs offer citizens the tools and information needed to help restore native oysters, Crassostrea virginica, to the Chesapeake. Until the 1980s, oysters supported the most valuable fishery in the Bay. Today, as a result of decades of pollution, overharvesting, and disease, the Bay's native oyster population has been estimated at as low as one percent of historic levels. Yet oysters remain a keystone species in the Bay's ecology. They filter algae, sediment, and other pollutants and in the process improve water quality and clarity. Their large reefs provide habitat for fish, crabs, and other Bay organisms. 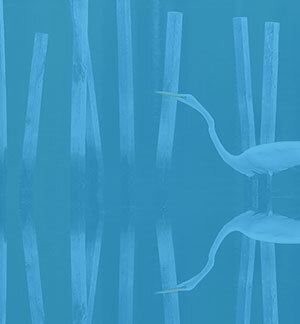 Restoration is critical to help improve the Bay's water quality and increase its economic viability. CBF's Oyster Gardening program allows citizens and students to grow oysters alongside their docks. Gardeners raise the oysters from juvenile to adult, and plant them onto sanctuary oyster reefs after one growing season. Oyster shells are becoming increasingly scarce. Through CBF's Save Oyster Shell program, shells that would typically be thrown away are saved and used in a variety of oyster restoration projects. In support of re-establishing this keystone species, CBF has established the Virginia Oyster Restoration Center (VAORC) in Gloucester Point. The VAORC operates a small scale commercial oyster farm to demonstrate the commercial feasibility of oyster aquaculture to watermen and other entrepreneurs. The VAORC is also the homeport of the innovative oyster restoration vessel Chesapeake Gold, used for the aquaculture program and for assisting partners with restoration and research projects. We rely very heavily on volunteer help to make our oyster restoration program work and we are always looking for volunteers.